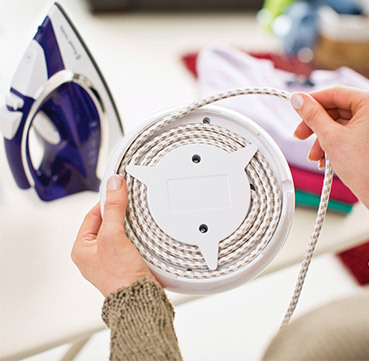 With no cords to hold you back, you can iron your clothes wherever you feel most comfortable. The Russell Hobbs Supreme Steam Cordless is as innovative as it looks. It sits on its own Smart Light Ring. The ring acts as a safe and secure base and lights up to let you know about your iron’s status in use. The light ring has indicator modes to let you know when it is heating up, ready to use and re-charging. 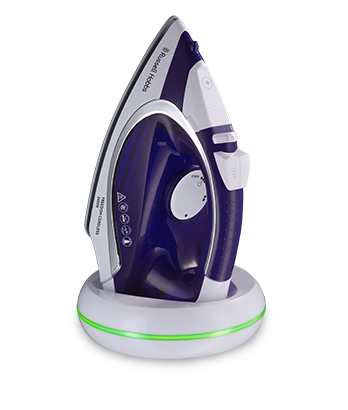 It has a fast re-charge time, variable temperature control and steam settings so you can choose the right level of heat and steam for the fabric you’re ironing. The Supreme Steam Cordless has a capacious 300ml transparent water tank so you can see at a glance when it needs topping up. 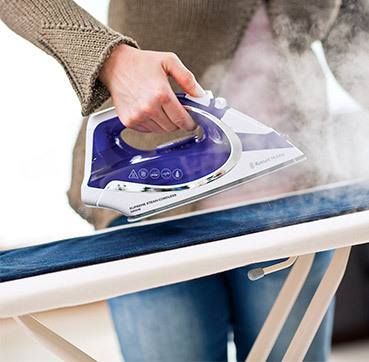 If you need to tackle tougher creases in linen, denim or canvas, the iron will deliver a powerful 135g burst of steam. A 40g continuous shot of steam will target creases in lighter fabrics such as cotton clothing. 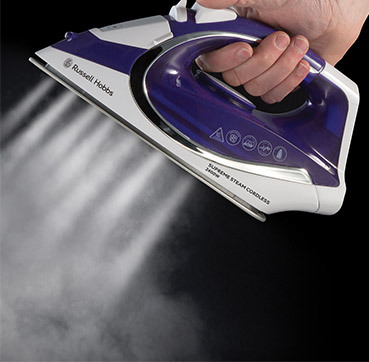 It also has a powerful vertical steam function that’s ideal for smoothing hanging garments, curtains and upholstery. In addition the variable steam function allows you to control the level of steam you apply. If clothes have been left to dry for too long creases can be a firm fixture. Giving fabric a quick spray is a good idea to soften it up and make ironing easier. It also has an anti-drip function to protect your laundry from water droplets. With no trailing cables, and power cord storage in the base, the Supreme Steam Cordless is a hassle-free appliance that will be an indispensable part of your laundry routine. Ideale per eliminare le pieghe da tende e capi appesi. Grazie alla ceramica, la piastra scorre perfettamente eliminando anche le pieghe più difficili.